What are the different shapes of diamonds? You are sure to find a diamond shape that suits your taste and style. From the most popular diamond cut to what a rectangle shaped diamond is called, discover the unique diamond cuts and their characteristics below. A cushion shape diamond has soft edges and round corners that resemble a cushion or pillow, hence its name. This diamond shape has been around for almost 200 years and was previously known as “old mine cut”. View GIA Graded Cushion Shape Diamonds. It has larger facets which give it more fire and brilliance compared to other most other diamond cuts. This also adds to its unique antique feel, a popular choice for diamond engagement rings. These larger facets also highlight the diamond's clarity, therefore we recommend selecting a diamond with a high clarity. Cushion cut diamonds vary in their shape, which ranges from square to rectangular. For a cushion-cut diamond that is square, look for length-to-width ratios between 1 and 1.05. If you prefer a more rectangular shape, look for length-to-width ratios greater than 1.15. Oval shape diamonds are a popular choice for diamond engagement rings because they offer great fire and brilliance, similar to that of the round brilliant cut diamond. View GIA Graded Oval Shape Diamonds. An oval diamond is an elongated version of the round brilliant diamond and is generally polished with 56 facets. They are known for their unique shape, offering a slightly different option for those wanting a diamond shape. This diamond shape has an additional advantage of appearing larger than its actual carat size because of its elongated shape, which accentuates slender fingers. For a traditional oval diamond shape, look for length-to-width ratios between 1.33 and 1.66. The pear shape diamond is a unique hybrid cut, and combines the marquise and round brilliant. This brilliant cut diamond is also called a teardrop for its single point and rounded end. View GIA Graded Pear Shape Diamonds. A quality pear diamond ought to have very good or excellent symmetry, and the point of the diamond should be in line with the apex of the rounded end. Pear diamonds are typically polished with 58 facets, which allows light to pass through the diamond much in the way light passes through a round diamond. The point of the diamond is recommended to be set with a prong, to ensure that most flaws and inclusions will be covered by the prong. Its unique shape makes it a popular choice for jewellery, including diamond engagement rings, pendants and earrings. The length of the diamond elongates fingers for a sophisticated and elegant look. For the most traditional pear-shaped diamond, look for a length-to-width ratio between 1.45 and 1.75. A heart shape diamond is considered the most romantic of all the diamond shapes. The unique look of the heart shape diamond makes it a distinctive choice for a variety of diamond jewellery such a diamond engagement rings and pendants. View GIA Graded Heart Shape Diamonds. Heart shape diamonds are a modified brilliant cut, polished with 59 facets. They come in a variety of silhouettes, ranging from narrow to wide – which is based on personal preference. They have a cleft at the top and typically have great brilliance. 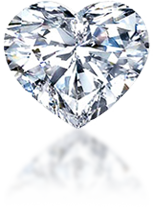 When looking for a heart shape diamond, symmetry must not be overlooked and the two halves of the heart should be identical. Three prong and bezel settings are the best match for heart diamonds. To find the dimension of heart-shape you want, look for the length to width ratio, which will determine the diamond's outline. For a more traditional heart-shaped diamond, look for length-to-width ratios between .90 and 1.10. The Marquise cut diamond has two sharp points on either end and is typically polished with 58 facets. This shape was inspired by the smile of Marquise de Pompadour and commissioned by King Louis XIV, who wanted a diamond to match the smile. View GIA Graded Marquise Diamonds. A marquise-cut diamond is considered a classic diamond shape because it compliments any engagement ring. This diamond shape looks beautiful when set with round or pear-shaped side stones, and the length of the marquise makes fingers appear long and slender. Its shape maximises carat weight, giving you a much larger-looking diamond. When selecting a marquise diamond, colour and clarity are the two most important aspects to consider. A marquise diamond is cut in a way that is similar to a round brilliant diamond, except the carat weight of the stone is maximised by lengthening it into its highly recognisable boat-shape. For the most traditional marquise-cut diamonds, look for length-to-width ratios between 1.75 and 2.25. A princess cut diamond is square in shape with pointed corners. Also known as a “Square Modified Brilliant Cut”, this diamond is generally polished with 50 or 58 facets, depending on the pavilion of the diamond. View GIA Graded Princess Cut Diamonds. Princess cut diamonds are the second most popular shape diamond for diamond engagement rings. They are an ideal choice for those who like the brilliance of a round diamond, but prefer a square shape. Princess cut diamonds offer great value per carat, as more of the rough diamond is preserved in the cutting process. The top of a princess cut diamond is square while the bottom looks like an inverted pyramid. Although princess-cut diamond may appear slightly smaller than round diamond due to their shape and typically greater depth, they are cut to achieve the highest degree of brilliance and offer maximum light return. This is a result of the fact that they are cut to follow the natural crystalline structure of the diamond. When choosing a colour grade, consider that while the price of a prince cut diamond in a lower colour grade is good, the colour may be visible in its corners. Princess cut diamonds can vary in how square or rectangular they are in shape. For a princess diamond shape that is square, we recommend you look for length-to-width ratios between 1 and 1.05. Emerald cut diamonds are named as such because the cut was originally only used on emeralds. They have step-like facets, rectangular shape and trimmed corners. View GIA Graded Emerald Cut Diamonds. Although emerald-cut diamonds are less brilliant than round diamonds or princess diamonds, they are revered for their clarity. This shape is often reserved for top colour and clarity diamonds due to its larger, open table. Because of this long table, inclusions are more easily seen on emerald shape diamonds than other more brilliant cuts. Typically polished with 44 facets, Emerald cut diamonds can vary greatly in how rectangular they are. The length-to-width ratio will determine the diamond's outline, or what it will look like when viewed from the top. For the classic emerald-cut shape, look for a length-to-width ratio between 1.30 and 1.40. Also known as a “cut-cornered rectangle (or square) modified brilliant” diamond, a radiant diamond is square or rectangular in shape with trimmed corners and 70 facets. View GIA Graded Radiant Diamonds. They offer beautiful brilliance and distinctive facets. They are an ideal choice for those who prefer a square or rectangle shape diamond engagement ring with an extra sparkle. Its shape also makes it a versatile choice for jewellery such as diamond earrings and pendants. A radiant cut diamond looks equally beautiful set with either baguette or round side-diamonds. Radiant cut diamonds can vary in their degree of rectangularity. For a radiant diamond shape that is square, look for length-to-width ratios between 1 and 1.05. If you prefer more of a rectangular shape, look for length-to-width ratios greater than 1.10. The criss cut diamond is elongated in shape with trimmed corners but has step-like facets that cross each other in a criss-cross manner. View GIA Graded Criss Cut Diamonds. Polished with 77 facets, the criss cut diamond is either rectangular or octagonal in shape. The facets continually bounce light off one another to give the criss cut diamond life and depth of fire, brilliance and scintillation. Criss cut diamonds are a great choice for those who love the elegance of the emerald cut diamond but want more sparkle and scintillation in a diamond engagement ring. Asscher cut diamonds became very popular during the 1920s and as a result, are a desirable diamond cut for a vintage looking diamond engagement ring. View GIA Graded Asscher Cut Diamonds. Asscher-cut diamonds are a beautiful and popular diamond cut that is characterised by a step cut and cropped corners, giving it a unique, almost octagonal shape. It is nearly identical to the emerald cut, except that it is square. Also, this shape has a pavilion that is cut with rectangular facets in the same style as the emerald-cut. If you choose SI-clarity be sure to view the clarity plot on the diamond certificate, because this shape highlights the clarity of the diamond. When choosing a colour grade, consider that while the price of a J-colour non-round diamond is exceptional, colour may be slightly visible in its corners. For an Asscher cut diamond, look for a length-to-width ratio of between 1.00 and 1.05. Round brilliant cut diamonds are the most popular diamond shape and cut. Their timeless beauty makes them an ideal option for jewellery – from diamond engagement rings to diamond earrings, bracelets and pendants. View GIA Graded Round Diamonds. Round brilliant cut diamonds are generally polished with 57 facets and are known as the Ideal Cut with perfect proportions. For over 100 years, diamond cutters have used advanced theories of light behaviour and precise mathematical calculations to optimise fire, brilliance and scintillation. A round cut diamond generally gives you more flexibility in terms of balancing the cut, colour, and clarity grades while still getting the fire and brilliance you desire. For the maximum brilliance of a round diamond, select the highest cut grade (very good or excellent). Round diamonds are cut to hide colour and conceal inclusions, which makes this diamond shape ideal for those on a budget as they can get larger carat weight diamond without sacrificing appearance.